If you are between the ages of 55 and 65, retirement is no longer a hypothetical time of life for “other” people: it now faces you squarely, asking persistent, nagging questions such as: Have you saved enough? How will you replace your employment income? Where are you going to live? For the first time since your twenties, you can probably predict that whatever you are doing now is not what you’ll be doing in ten years. Here are five tips to help you succeed in this stage of your life. This means stop putting off any retirement planning. A CERTIFIED FINANCIAL PLANNERTM professional can play a key part of your success. There are literally thousands of investment vehicles and insurance plans – it is almost impossible for you alone to know what’s best for you in today’s complicated market. 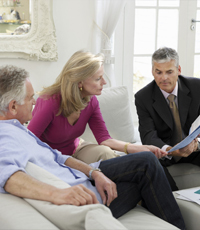 Your retirement is important enough to consult a professional to ensure it’s a successful one. This is one of the best times to get creative with tax planning. Because those at this age don't have to worry about the too early, too late, too little, or too much rules that otherwise govern withdrawals from tax‐advantaged retirement accounts. This one is easy: do whatever possible to pay off your mortgage before you retire. In retirement, you want most of your expenses to be discretionary, not fixed. This is so important that we must remember: a few more years of work to pay off the mortgage can make a tremendous difference in the amount of retirement money you will have available. Similar in theme to tax planning for those between 55 and 65, these accounts represent a triple tax play. There's a tax deduction when funded, any savings grow tax deferred, and the money is not taxed when withdrawn to pay medical costs. People between the ages of 55 and 65 should rebalance their investment accounts each year. Gone are the long‐term investment strategies; the need to recalibrate one’s investments grows with each year into retirement.